When you’re a silly person, Daily Creates (TDC1515) like this one, that obviously call for some response on a deeper more meaningful level, are trouble. This Daily Create is not asking for something trite. But I’m all about the trite! So I’m embracing the trite. Make a drawing with a tree, a seed and a star joining to create an image together. I look forward to other’s responses on that deeper more meaningful level. But for me and my MS Painting skills, that were cultivated over many years of very occasional half-hearted use, here’s what you get: A barely anthropomorphic tree who saw the stars. He did see them. He see’d them. 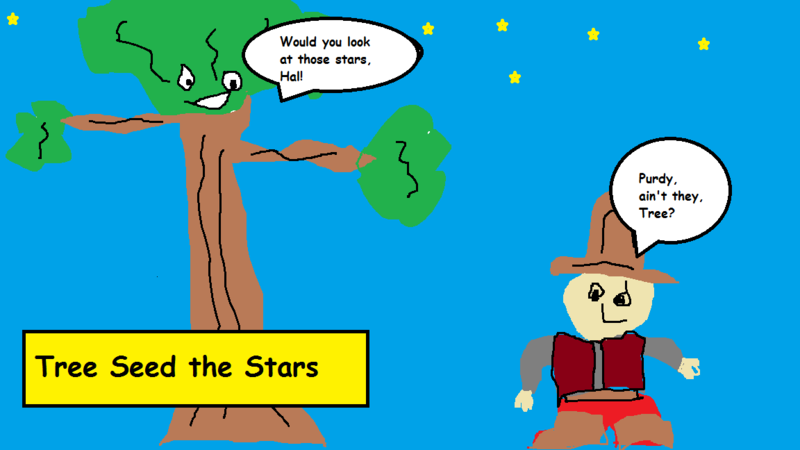 And the tree’s happy little cowboy friend with the cool vest see’d them, too. Sorry.